1. Hina Rabbani Khar: Beauty without brains. 2. May be we should counter Hina Rabbani Khar by making Digvijay Singh the External Affairs Minister? 3. Dear Hina Rabbani Khar (HRK), you may be glamorous like @iamsrk but when you speak, you sound more like @kamaalrkhan. 4. Hina Rabbani Khar is a hybrid of an ostrich and a kangaroo. Refuses to face the reality and carries a bag where ever she goes. 5. Thought Her To Be of Penguin Mother & Sea Horse Father. 6. Hina Rabbani Khar is having a relationship with Bilawal Bhutto? Man, she's going from Hermes to Herpes pretty fast. 7. Hina Rabbani Khar is allowed to act all arrogant and ignorant, guys. After all, she is HRK. 8. Hina Rabbani Khar. So pretty. So shrewd. What a character she'd make in a book or a movie. 9. Quit making fun of Hina Rabbani Khar for her big, expensive bags. She needs them to carry a lot of hate and stupidity. 10. Hina Rabbani Khar says India is war-mongering ! Go back to your birkin, love! 11. Meanwhile, darling of India's SECULAR tribe Hina Rabbani Khar says, "Outrage in India not worthy of any response"!!! 12. Pak Foreign Minister Hina Rabbani Khar: We are a mature nation who behaves responsibly...Talk about beauty with immense sense of humour! 14. 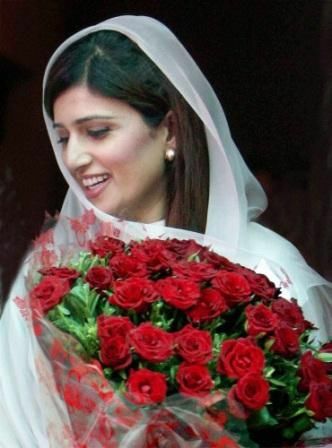 Hina Rabbani Khar for Jism 4 or 5 ? 15. Dear Hina Rabbani Khar, we shall accept all what you said, provided you appear on Arnab Goswami's show and win the argument!